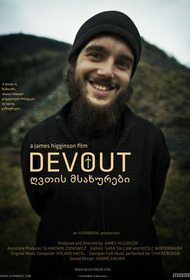 Penetrating deep into the Caucasus mountains and remote villages of Georgia, film auteur James Higginson takes the viewer on a journey into a land that is remote and undeveloped, a place where one can find God. Or so one thinks. Where else in this globalized and secular world would God be lurking these days if not in this unfamiliar territory? With a sure hand and observant eye, Higginson pulls us into this unknown Georgia—not the Georgia on your mind, not the Georgia you take the midnight train to—but a beleaguered province, held tightly and unwillingly in the grip of Russia. 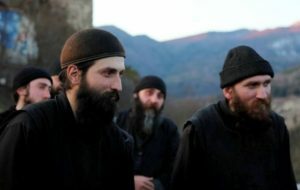 Although the film opens with the desperate grief of a young man we learn is a monk in the Georgian Orthodox Church, the war and politics that tore the small republic apart over five days in 2008, seem far away. In the early minutes of the narrative, before we even begin the journey, there is a brief montage in which the monks are chopping wood: an axe cleaves a log in two and the pieces fall to the ground with a thudding clatter as if emphasizing the monk’s agonized disillusionment—but we do not understand his pain. 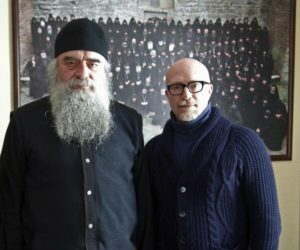 For those who know Higginson’s work, uneasiness is always a subtext and, from the very beginning, he sows seeds of foreboding, which, in this film, are belied by the serenity and peacefulness of his portrait of monastic life in the twenty-first century. 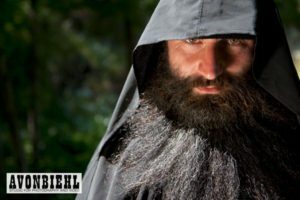 For the contemporary American viewer, used to living large in a secular society, a question might be raised: why would a young man join a monastic order? The answer may not be just personal and spiritual but certainly could be rooted in recent history. After the overthrow of the Czar, Georgia was set free from imperial rule and enjoyed a brief independence until, in 1921, the Soviet Union, reflexively seized the land again, crushing its ancient Orthodox version of Christianity. Being one of the first versions of the Christian religion, the Georgian Church owns the title “Orthodox” proudly, jealously guarding its heritage ever since the fourth century when the Church was established. Tucked away, greatly distant from Moscow, the Orthodoxy was able to maintain its uniqueness even as the Soviets crushed religion in all the territories under its control. During these dark decades of Communism, it was the Church that maintained the Georgian culture and it heritage so that when the regime crumbled in 1991, the local religion sprung back to life as a signifier of resurgent ethnic identity. The numbers of young men joining monasteries went from less than one hundred to over a thousand. But eight years ago, Georgia, an ancient land which had existed as a territory in its own right since the Medieval period, fought a brief war with Russia, attempting to be free once again. The Russian reaction, under Putin, was swift and merciless, reducing, in five horrible days, the Georgian population in conflict zones by 75%. Only at the beginning of 2016, did the International Criminal Court agree to take up the question of war crimes by the Russians against the Georgians. 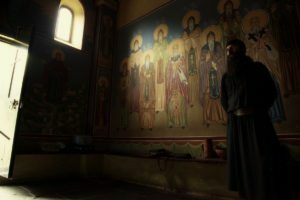 Against this background of piety, nationalism and war, the monasteries offer sanctuary for a generation yearning for peace. 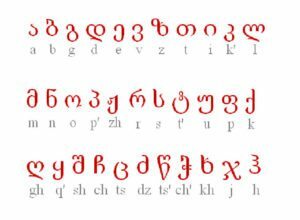 The original music in the deep background is based upon Georgian folk music, which, like the local language is being salvaged from deliberate Soviet extinction by those elders who remember what they learned as children. 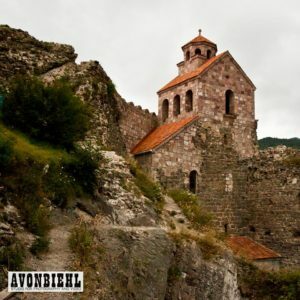 Laced throughout the score is authentic Georgian songs and melodies, lending a melancholy and soulful theme to the thoughtful account of monastic life. With deliberately slow pace, Higginson follows a young monk down the dirt roads leading deep into Georgia, far away from the contemporary and yet inhabited by modern people living an ancient way of life. The viewer, curious about experiencing a place few outsiders visit, walks behind a few paces, following the black clad figure, but content to keep a discrete distance. 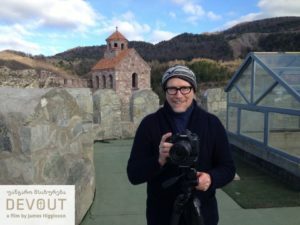 Although Higginson filmed at seventeen monasteries, he limited himself to the humble and the ordinary residences, the small and the local, while eschewing the majestic and picturesque monastic sites that soar out of the mountains and call out to worshipers. These monasteries, found by the artist, are found as one traverses the lowlands, the ravine, called the Sacred Ravine, that cuts through surrounding peaks. Given the frequent seismic actions of the region, these grounded monasteries would seem more secure than some of the airborne brethren such as Motsameta, perched on a cliff face. Like the quiet undramatic landscape below with its mores modest mountains, these settlements are, at first glance, ordinary, but Higginson, with his perceptive eye, draws out inherent and unexpected beauty in the quotidian environment of the monks. This all male world is punctuated and revealed by the everyday objects used by the secluded inhabitants as they live out the simple days of their plain lives. 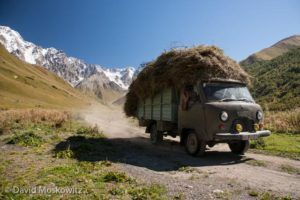 Our first stop is the Mozovreti Monastery, which requires a pilgrimage up a long and winding road, ending at the modest square building perched on a ledge, gazing over green ranges, lined up in sequence towards the distance. It is not the view that interests Higginson but the life inside in settlement, so we are allowed to enter the humble refractory, with strong stone walls, creating a banqueting hall populated by picnic tables covered with yellow and pink flowered oilcloth table coverings. Icons stud the wooden columns and a modern microwave nods to modernity. The community gathers together to prepare a meal that is humble but shines with the natural allure of fresh vegetables transformed at the hands of the monks into a succulent repast. High in the carillon, the monastery has a set of bells which, like the shared meals, are rung in tandem by a team of skilled musicians. 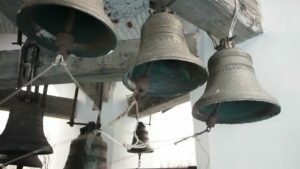 The camera looks up, following the movements of the arms of the players and the tilt of the bells as the tongues toll the ancient sounds. The monks do not chime tunes or songs but, instead, simply toll, making a joyful noise unto the Lord. The next stop is a very different kind of monastery, the Bana Monastery, obviously newer than Mozovreti. 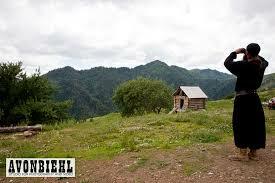 Nestled in the lowlands, in the rolling fields fitted among the hills, are a group of small tin roofed log cabins housing the small community of bearded devouts, called to God. Monks, guided by their Archbishop, are of all ages, old, young, middle aged. Their preferred attire, dark robes, closely fitted caps, and heavy sturdy boots, would blend in nicely with the monks of two hundred years ago. It is as though time was stopped when the Soviets came to power, suppressed the monastic life. 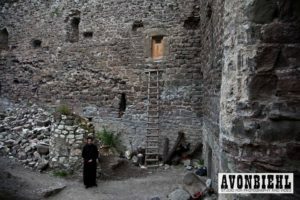 When Higginson arrived, it was only the second decade of recovery and these old monasteries, dating back centuries, were slowly coming back to life and recovering long lost cultures. 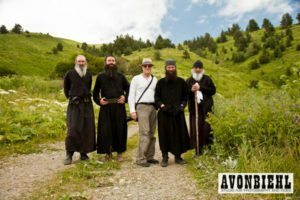 The journey among the monasteries is a gentle one, moving quietly along woodland paths, past streams and waterfalls, and wildfires swaying in low winds. The landscapes presented to the viewer are intimate, on human level, eschewing grandeur. The domiciles of the monks are simple and plain, using only natural materials and natural colors, grays and browns against the black robes. Higginson uses color sparingly, a strong yellow flower as a punctuation mark, a low red roof as a grid, paralleling the horizon line, the pale blue of misted mountains in the distance. The ambient sounds are as simple, the lowing of cattle, the song of the bird, the even voices uninflected voices of the monks surrounded by their inner stillness. The most sensuous aspect of the film is the food prepared and shared by the monks. The local rugby team of teenaged boys takes a meal with their teachers while one monk reads to the congregated dinner companions from a spiritual tome. In contrast, the long table is lined with large colorful bottles of soda pop, a concession to the young players. 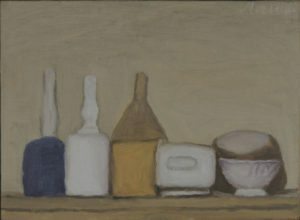 Higginson composes each shot like a still life in the tradition of Giorgio Morandi, with his quiet Whistlerian colors. Located at the banks of a small mounting river, Shatberdi Monastery is also fully restored and it is the vivid frescoes and gold filled icons that provide the most color and light for the film, bursting brightly upon the all green landscapes of summer. Regardless of the internal and private splendor, reserved for God, inside the monastery, the life outside the stone walls is simple and timeless, the digging of the land, the sowing of the seeds, the drawing of the water, the gathering of the harvest. One of the sites Higginson draws the viewer into is a church, caved into the side of a mountain. It is here in this dark interior that the film bursts with color—the red robes trimmed in gold donned by the monks for the ceremony, which is as simple as the robes are opulent. There is hand-made, made-up quality about the ritual as if something long extinguished was reignited with imperfect memory. Only men are allowed to attend in keeping with the Orthodox faith that does not admit women as equals. In Russia, this faith, compared to the way Christians worship elsewhere, is without tolerance—hostile towards women and homosexuals and nonbelievers. Beneath the quiet and gentle existence is darkness, whispered but not belabored by the tactful auteur behind the camera. The monk, Father Anubi, whom we met at the beginning of the film, is always our guide, not to the religion and its dogmas, but the meaning of how spirituality fills the human being who can live a life, that is at once ordinary and in harmony with God and nature. This is what the father calls “the sweetest path,” “the path to our salvation.” He is our thread who allows us to connect one section of the film with another. The episodic structure begins to reveal itself as road movie, punctuated by stops at these Georgian sites of worship where the inhabitants, facing the viewer, explain their lives and their faith and their convictions. We read, through subtitles, the rules by which they live. The small moments are enclosed within a meta codex of folios, bound by the journey, undertaken by the simple act of Father Anubi walking from one place to another. Seclusion from the secular world is necessary to attain this state of grace, which is reconciliation with God, a moment where joy is to be found. Safe from the corruptions of the world and enfolded in a remote community, the monks find peace on their simple farms in their remote monastic retreats. The clergy allowed an American filmmaker, based in Berlin, a thoroughly worldly and very technologically savvy artist, into their lives. Such access was an act of faith in and of itself. Weathering years of bureaucracy and overcoming barriers of social opposition, Higginson entered into a series of closed communes on trust. Once inside, he filmed formal interviews or on the other end of the spectrum, the basic daily functions, such as bread making and the stacking of hay into dome shaped stacks, dotting the green fields with golden mounds. 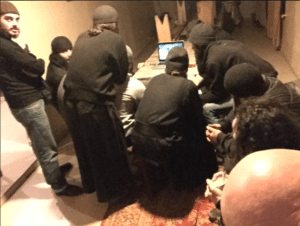 Although the grain is eventually taken away in a truck (a process photographed by David Moskowitz), we see little of the mechanized world and yet there are forbidden cell phones and rugby teams, when the monks integrate with nearby communities. As we witness, we notice that no physical movement of the monks is wasted, each gesture is purposeful and economical in strong contrast with the rest of the world where all is performative. The sunflowers, moving in the breeze, their leaves rustling, are more active than these self-contained monks. The message, given in spoken word and ancient song, is as simple as the way of life the beliefs support—to live by the ideas found in the sacred testaments, both Old and New, to live by the moral and ethical laws of God which are eternal as opposed to the always changing ways of the world. But towards the end of the film, the Archbishop, the spiritual leader of the communities visited by the filmmaker, reveals his knowledge of the globalized world and its perils, even in the remote Dzama Valley. His is an apocalyptic vision of humans awaiting the appearance of the AntiChrist, recognizable only by the Orthodox. We the undevout are implanted with microchips, designed to control us, and when we buy our worldly objects, the code of the Antichrist, 666, is embedded in the bar codes. But the statements by the Archbishop are presented as routine, part of the Orthodox belief system, the unrealistic rigidity that underlies the spiritual beliefs that, the viewer realizes, are not open to all. 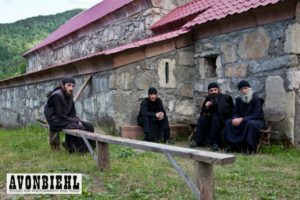 The film ends as elusively as it began, a journey continued by a young monk, who left the monastic life briefly but returns, because there is no other life possible for him. We witness his final voyage towards perfect peace as he walks down a dirt road, guided by a silvered path of standing water from summer rains. The dark clad figure disappears down a path that is concealed between the sides of the ravine that is his future.